Today’s Chamber Board of Directors meeting featured an update from Wurstfest President Eric Couch on the newly developed area at the Wurstfest grounds to be unveiled to patrons at the festival on November 2. Couch’s presentation provided an explanation on the newly developed area on the Wurstfest grounds. The expansion adds an additional 20% to the overall festival grounds, and the Chamber’s November Membership Mixer will be held in the new area. Following Couch’s presentation, Chamber Board Chair Robin Jeffers surprised board member Stephen Hanz with a Chair of the Board Award in the field of tourism development for his efforts with Wurstfest and in particular the new area. Hanz led the master planning with the Opas on the space in conjunction with Douglas Architects. 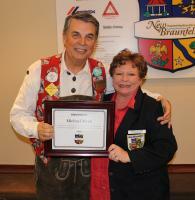 Hanz is a former President of the Wurstfest Association and is also an Opa Emeritus in the ogranizaiton. Blue Coat Chair Brandon Dietert announced the 3rd Quarter Blue Coat of the Quarter as Art Brinkkoeter and Senior Blue Coat of the Quarter as Joseph Timmins. Each received a special badge for their Blue Coats. The Board also celebrated a staff tenure award for Chamber President Michael Meek for 30 years on staff with the Chamber. Meek joined the staff in 1988 as the CVB Director, moved to be the Chamber’s first Economic Development Director in 1991 and then was named Executive Vice President. He became President and CEO in April 1995.